Growing up, we had certain treats and goodies that Mama *always* made at Christmas time. We would mark how close the big day was getting based on how far down Mama had gotten on her list of things to make. Inevitably, Cheese Straws made an appearance, usually a bit closer to Christmas Eve. If you’ve never had a Southern cheese straw, you’re missing out! They are sharp, a bit spicy, and filling. 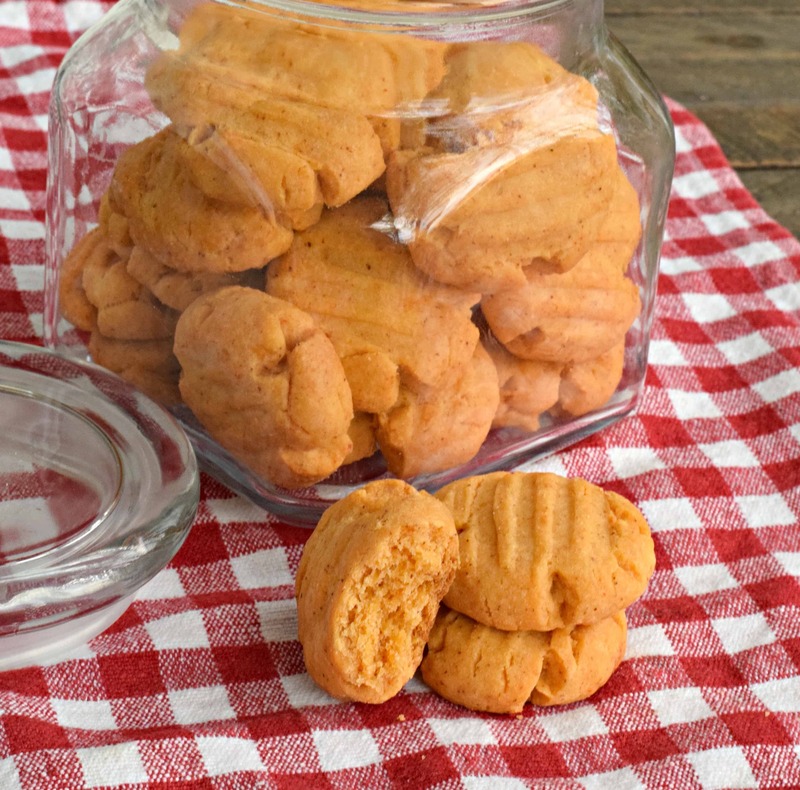 However, most younger folks are put off by cheese straws because they are a bit fussy to make and require a cookie press with a special attachment. Yeah, they are high maintenance things. 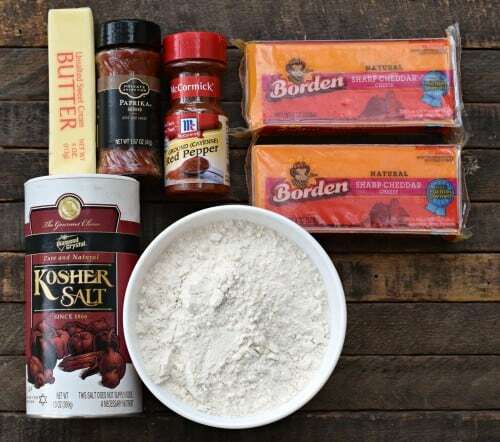 To make these you’ll need: Butter, Paprika (optional), Cayenne Pepper (ground), Borden Sharp Cheddar Cheese, Kosher Salt, and All Purpose Flour. I am specifically using Borden cheese here because it is delicious, all natural, and is made by a cooperative of over 8,000 family owned dairy farms across the United States. The cheeses they offer include: Mild Cheddar, Mozzarella, Mexican, Swiss, Sharp Cheddar, American, Colby Jack, and more. They are available in singles, shreds, chunks, slices, strings, and snacks! This is creamy, flavorful, delicious cheese made in our homeland and it just makes every dish better. 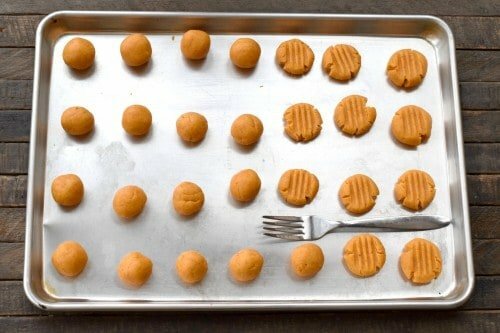 IMPORTANT TIP: Before making these, place your cheese and butter out and leave them on the countertop overnight to make sure they are completely room temp before attempting this recipe. This recipe couldn’t get any easier. Dump all of your ingredients into a large mixing bowl and beat with an electric mixer until fully combined. Now listen, at first you are going to think there is no way this is going to combine but if you stick with it (and if you left your cheese and butter out all night like I mentioned) it will combine into a stiff cookie dough like consistency like this. Note: You are seeing a double recipe pictured here. 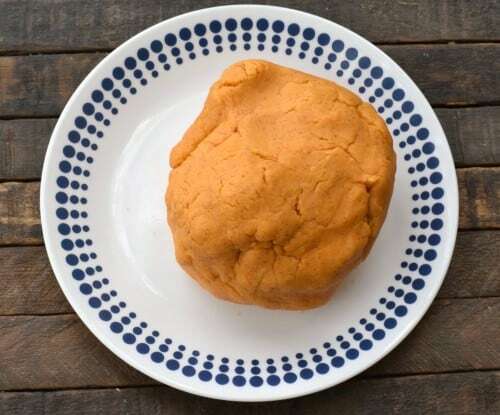 Break off a softball size ball of dough and knead it a few times with your hands. Then, pinch off smaller portions (about one inch balls) and knead them each individually before shaping into a ball. 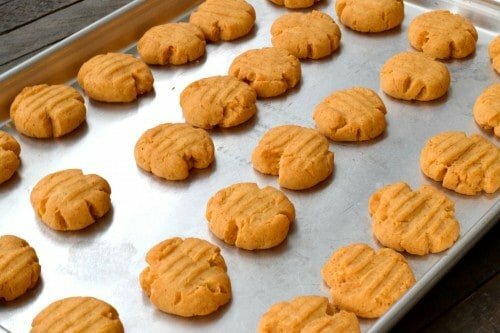 Place these on an ungreased cookie sheet and flatten slightly with a fork. Bake at 400 for 15 minutes or until lightly browned on the bottom. If you like, sprinkle with paprika as soon as you remove them from the oven (totally optional). Let cheese and butter sit on countertop overnight to come to room temp. 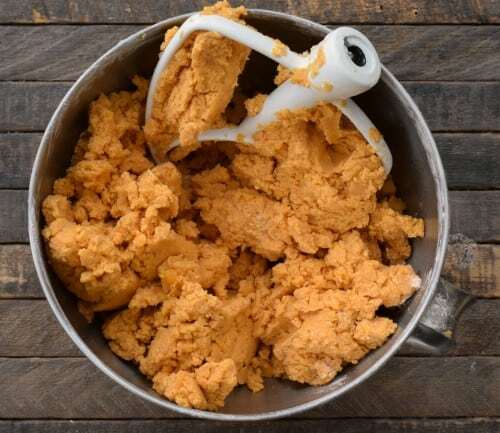 Combine all ingredients in a large mixing bowl and mix until well blended and dough is the consistency of cookie dough. Break off a large softball sized portion and knead it with your hands. Break off one inch size pieces and knead each one a time or two before forming into a one inch ball. Place on ungreased baking sheet. Using the tines of a fork press down slightly on each ball. Bake at 400 for 15 minutes or until lightly browned on the bottom and dry. Allow to cool and then store in an airtight container. Special thanks to my friends at Borden Cheese for sponsoring this post. 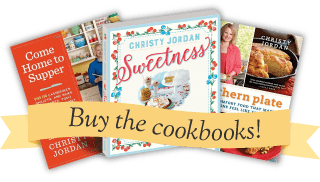 I appreciate their support of my work and their help in bringing you more recipes! Visit Borden’s Facebook page by clicking here. Click here to visit them on Instagram. Meal Plan Monday #43 – More Suppers With Your Family This Year! I buy Borden cheese most of the time. I feel like I am supporting our dairy farmers here when I do. do you shred the cheese…or cut in chunks? I just put it in the bowl and go to town with my mixer 🙂 as long as you let it sit out overnight it will be soft enough. darling one, I don’t mean to be one of those people, but what, please, is an “engrossed” cookie sheet? p. s., I think some Tabasco is gonna get spilled in my batter, too… hummers. love to all y’all, always. At one time you had posted some bible reading guides. I searched and can’t find them? Look at the top right corner of the site and you’all see “scripture writing”, I think that is what you are looking for. Now instead of writing them out could you just read them? How do you cook brown rice so it is not mushy? Ever time I cook it it’s mushy ? I cook it for your chiken fried rice recipe amdti triple the recipe. So I cook 3cups of dry rice. Try in a big pot of boiling water as you would do pasta but for about 25 minutes. Then strain through a fine strainer. I accidentally bought “smoked paprika” – didn’t even realize there are two kinds of paprika! – and now I don’t know what to do with it. Would it work as the paprika in this recipe, do you think? I think it would work, just give it a little smoked taste. I love smoked paprika and use it in a lot of recipes, especially chicken ones!! I put in a cup of rice krispee cereal. It makes them crunchy. I can’t wait to hear!! I hope they are exactly as you remember so you will have your aunt’s cherished recipe back!! Maybe I missed the answer….what is an engrossed cookie sheet? Mine don’t get “crunchy”. They’re tasty but soft. Any suggestions? Thanks much!! Probably they should be left in the oven a bit longer. If it looks like they’ll burn, try reducing the temperature a little. They do also have to cool completely before storing, or they will stay soft. These taste exactly like the cheese straws we used to make for Christmas gifts when I was growing up. And they are WAY easier! I always have to add a few spoonfuls of water to get the dough to hold together, even when starting with warm cheese and butter. But it never seems to affect the final product. Thanks for providing a way to enjoy these zippy, cheesy treats without breaking either my hand, my cookie press, or both! I am so glad you liked them Jackie! !